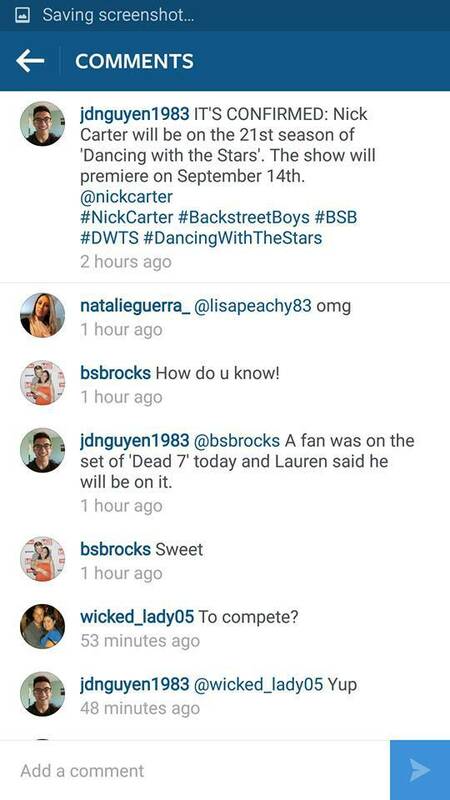 PureDWTS Season 21 Cast Possibility: Nick Carter? Gonna preface this with my usual “take this with a grain of salt” warning, as it seems like this might be reeeealllly early for the pros to be meeting their partners – but as it is a slow news day and I did find this rather curious, I will go ahead and share. Special thanks to CM for the heads up on this. Looks like Nick Carter of The Backstreet Boys just started following Sharna out of the blue – maybe he just met her at a party in L.A., maybe he just thought she looked like a cool person to follow, who knows…but the timing is interesting. Maybe Sharna was just having a good day, maybe she had just gotten word that she was going to be a pro again this season…who knows. But just seemed rather coincidental that both of the above events would happen on the same day. I don’t think it’s too much of a stretch for Nick to do the show – he’s from the only major boy band that DWTS has yet to cast from, plus his brother Aaron did the show back in 2009. And from the looks of the Backstreet Boys’ schedule, he’s free and clear until May of 2016. I think he’d be fun to watch, and if Sharna is, indeed, his partner – I think they’d be a good match.